For those of us who have creative streaks, we can often find ourselves deep inside a rut … sometimes one that we can’t get out of too. In fact, those are some difficult times for an artist. One of the things that I do when I’m in a “rut” creatively is to journal. However, I can often be found purchasing fabulous online tutorials for polymer clay. Or … I order a new polymer clay book and dive deep into it’s pages. Last year I led a year long project in conjunction with Christi Friesen called “The Friesen Project.” This year I am blessed to be a participant in another year long project, called the 52 Weeks of Canes as well as being a subscriber to Meg Newberg’s Cane Builder eZine. I have worked with polymer for more than 6 years now, but I have always had a general “fear” of caning. I have spent the past two years learning not to be afraid, and honestly have gone through a ton of clay because of the “learning curve” (Sounds better than failure, right)?! In doing so I have expanded my horizons and learned not to be afraid of caning and I am branching out and trying new things. All of this being said, this past week was spent exploring and just “playing” in my studio. I had very few specific goals … I just wanted to clay. So here’s a very small snapshot of some of that playtime. New Petal Canes! This past week I purchased a fantastic tutorial “Flowers Three Ways” by Debbie Crothers from CraftArtEdu. I used these canes to make oodles of flower pendant necklaces. You can purchase many of these necklaces in my Etsy Store. Bugidy Bug Bugz – With the cane ends and wonky pieces, I constructed little bugs! In addition I made a fabulous tutorial from my Tutorial Club Subscribers of how they can make their own bugs. If you want to receive 2 great PDF tutorials a month, click here and get the details. Most beautiful Stroppel Cane Ever – I have made a lot of Stroppel canes, but none of them have ever turned out this good. WOW! I can’t wait to make something out of this gorgeous stropped cane. It uses all my cane ends and pieces from the past week. 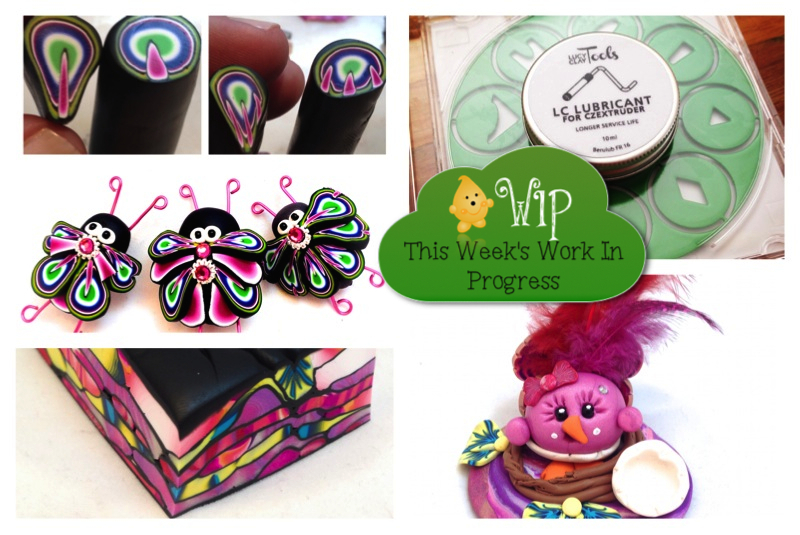 Lucy Clay Tools Fun – This past week my much awaited new Lucy Clay Tools die disc came. Woo hoo! I ordered the CZExtruder as a Christmas Present from Parker to myself and I am in such love. Never have I had an extruder like this. If you live in the USA, you can get yours from Kimberly Idalski’s Artfire Shop here. Lolly’s Bird-like Look – Because I’ve been in such a mood for Spring, flowers, & birds as of late … you know Lolly had to become a bird too. Personally, I think the feathers are fab. Adopt Lolly here.